First impression may not be the last impression in the world of emails, but it always matters—mainly because user behavior indicates that the maximum chance of emails being opened is only once. So what is it that ensures maximum open rates? Designing the perfect email isn’t just about finding the right images and colors for the message you want to deliver to your subscribers. The process includes everything from choosing a familiar “from” name to crafting the perfect subject line and ensuring your email does not look like a spam mail. Visually appealing email designs and flawless code are the basis to creating the perfect email experience. Even though email design is one of the most underrated aspects of the email marketing process, the impact email design can have on the success of a campaign is immense. So what are the things you need to take into consideration? 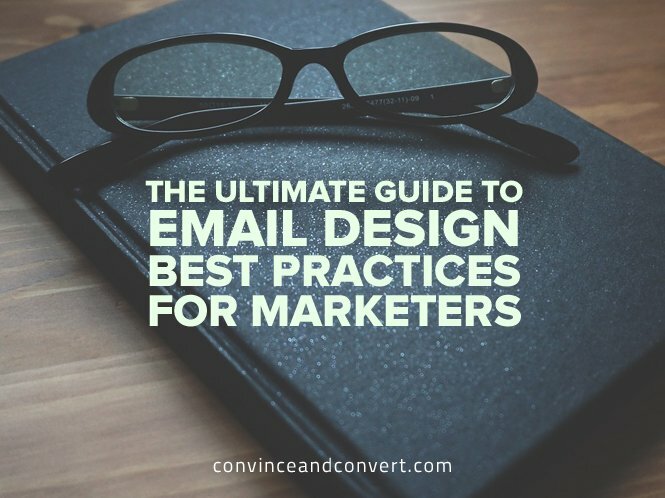 Brand optimization is by far one of the most crucial email design best practices. From including your brand name in the “from” field and using an identifiable address to ensuring that the “to” field carries the recipient’s name and not their email address, every part of your email should be on-brand. This is indispensable for ensuring email success and sustainable brand reputation. There’s no shortage of theories as to what to write and what not to write in subject lines, but what actually matters is the domain reputation. If you have a high domain reputation score, all those factors are obsolete; but if you have a low score, you need to take care that you stay away from using phishing phrases in the subject line that attract spam filters. Email marketers often fail to recognize the importance of headers and pre-headers in an email. Along with adding a link to an online version of your email, snippet text is one of the most popular trends at the moment, as many email clients like Gmail, Outlook, and the iOS mail app allow you to show snippet or preview text (usually limited to 100 characters or less). There’s also the “peek and pop” feature in iOS 9 and iPhone 6S, which allows email subscribers to peek at the content of the email from the pre-header section itself without even opening it. This features comes with its own limitations: Even though consumers are not really opening the emails, they will be counted as opened emails. Marketers don’t always place much importance on email layout: how it should look, its size, the text to be used, the fonts, the colors, etc. Studies indicate that an ideal email width is 500 to 650 pixels, and a vertical layout is preferred over a horizontal one. A table of contents should be used if you have a lot to cover in a restricted space. If you have multiple products or categories to display, a navigation bar can be key. Limit yourself to four or five sections for better visual emphasis, and include clear and appealing calls to action. “A picture’s worth a thousand words” is especially relevant to the media world. When it comes to email marketing, graphics and imagery should define content sections clearly. If you are using an image, it’s important to provide fallback color and alt-text for the image. Avoid background images layered behind text, as many of the email clients (such as Outlook) do not support background images. Avoid squishing or stretching of images in emails to ensure they’re sized appropriately. If you’re creating images for fluid emails, make sure they can scale up to 599 px. Make feature headers or product offers easily clickable in the email template. It’s all about making your email alluring—there is no second chance to make a great first impression. Content is an integral part of email design—it is the context and the copy that drives business from the email campaign. Besides using short sentences and paragraphs, make sure you use design elements like spacing and dividing lines to separate content sections. Add line breaks every 60 characters in your plain text emails to increase legibility. Also make use of bullets to make your content more visible while using web-safe standard fonts like Arial, Arial Black, Arial Narrow, Comic Sans, Courier New, Georgia, Impact, Tahoma, Times New Roman, and Verdana. Play it safe with a body copy font size of 14 pixels and 22 pixels for title. Even though the footer comes at last, it’s not the least—in fact, it’s one of the most significant parts of an email. 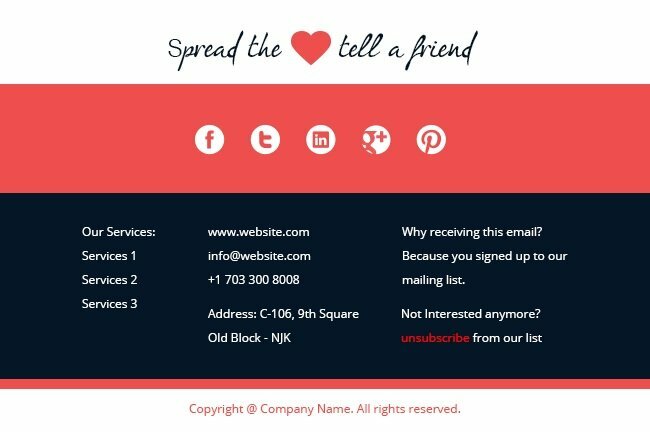 An ideal email footer should not include the organization’s contact details, but also links to main segments of your website, key services or products, and social sharing or “forward to a friend” buttons. Another significant addition to the footer that most marketers miss is a, “Why are you receiving this email?” line that will diminish chances of your emails going to spam folders. The introduction of block functionality by email clients like Gmail empowers subscribers to “block” a sender, which will ensure they’ll never receive an email from that sender again. Too many blocks can be detrimental to your sender reputation. Make sure you do not hide the unsubscribe button. Sharing icons within the email. Social icons on your unsubscribe page. Social icons on your “thanks for signing up” page. Sharing icons inside recurring email newsletters. Social icons in auto-responders and official mail signatures. Image blocking is one of the biggest challenges for email marketers. One of the proven solutions is to use bulletproof backgrounds and buttons, which will help display background images in Outlook as well. Make sure to check if your ESP supports VML (Vector Markup Language) coding, an XML-based file format for two-dimensional vector graphics. You can also use alt tags to create beautiful pixel art in emails as a clever way to reach out to your subscribers who have default settings to block images in their emails. 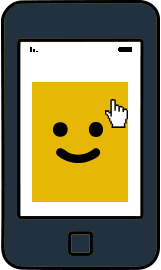 However, while using pixel art, ensure that you scale the images accordingly for smaller devices. Blurred logos, images, and icons in your emails are passé. Welcome to retina emails! All you need to do is double the normal dimensions of email images to around 1,100 pixels. This will not only reduce file size by 20 percent with no downsides, but also save them five percent on quality. With the advent of the mobile revolution, more and more users are using Apple devices to access their emails. Retina images in emails can be an important strategic decision for your company. The global wearable market is expanding at a compound annual rate of 35 percent and is expected to hit 148 million units shipped in 2019. This makes optimization of marketing emails for wearable technology viewing environments all the more important and a strategic decision for businesses nowadays. 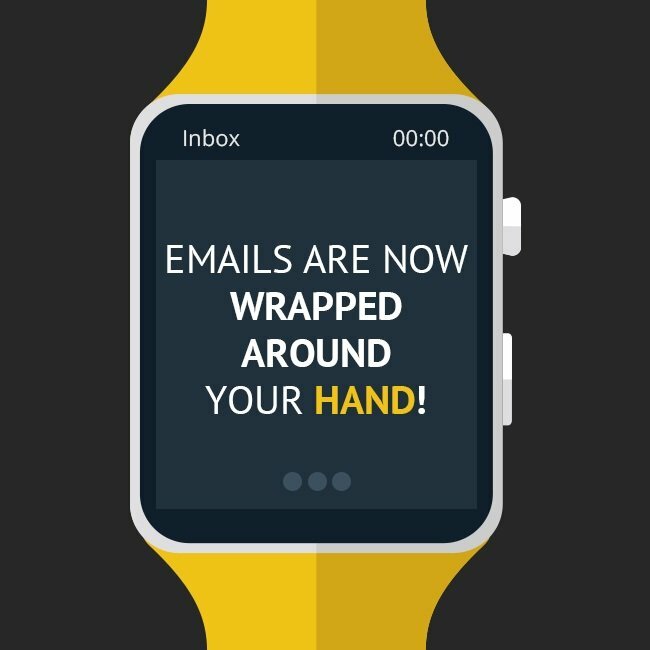 What needs to be taken into consideration when designing emails for wearables such as Apple Watch, Gear, etc.? In the absence of a browser on wearable watches, links in the plain text version are specified with grayed out text. Embedded images or remote images stored on your server will not render well; relying on plain text is the key. The revolutionary “peek and pop” feature that comes with iOS 9 and iPhone 6S has changed email marketing to a great extent. While the feature allows the subscriber to peek into your email without actually opening it, the challenge for marketers is that it gets acknowledged as “email opened,” possibly setting open rates stats in a tizzy. The pitfalls of this feature lie in the possibility of pseudo-signals, causing discrepancies in open rate values and reduced engagement. 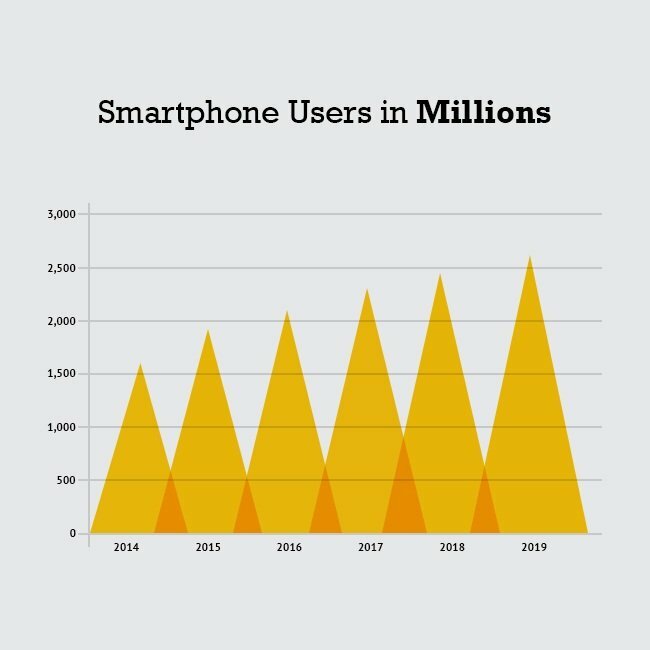 The world of email marketing has begun to brace itself for the growth of the smartphone industry, set to reach 2.65 million users by 2019. A sizeable 50 percent of users open their email on smartphones, and the number increases to 67 percent when taking into account mobile devices in general, making it all the more important to design emails that are responsive for greater reach. 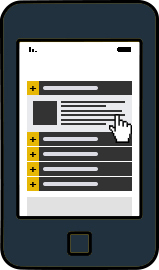 So what parameters do you need to consider while going mobile? Determine the number of third-party app users. For instance, if the native app on your iPad is Mail, you might also have other third-party apps for iOS to support it like Gmail, Yahoo!, and Mailbox, etc. If the majority of your subscribers are third-party app users, try using a single column layout instead of two or more columns, as a one-column format is more readable, while the latter crowds the screen space. Follow email design best practices that suggest emails should be designed for 320 and 480 pixel view. Make your CTA button a minimum size of 44×44 pixels with plenty of white space around it. Make sure you spread the button across the width of the email if possible, and set it apart from the rest of the email content so it’s conveniently tappable. Menus within emails are trending, thanks to the prevalence of responsive design. 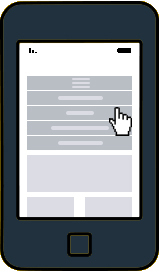 Also known as hamburger collapsible menus, you can find them everywhere these days in responsive mobile websites. Menus require mobile native app support. Having menus can be one of the best ways to allow users to browse across various products or service categories right within their inbox. Reinvent your campaigns by creating emails powered with accordions. This interactive feature allows you to stack content and send out more articulate emails without requiring recipients to scroll through a long email. Accordions are now popularly used in retail, media, and technology websites. One of the best attributes of accordions is that they allow you to provide different email layouts for desktop and mobile recipients. Accordions allows marketers to measure the clicks on the tabs and identify the area that draws the most engagement. 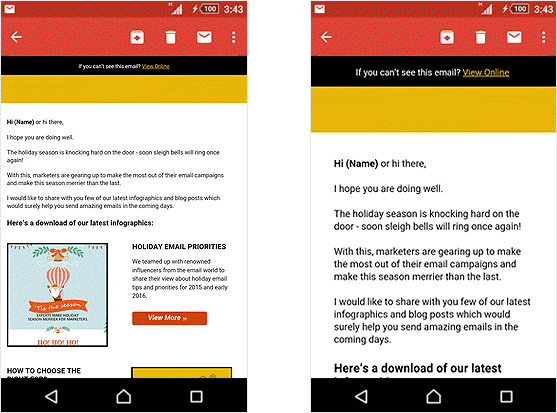 Responsive emails are great if your user base views emails in native apps on Android and iOS. But if your user base is viewing emails using third-party applications such as Gmail, media queries may be a problem, as they appear just like their desktop version. In such cases, you may consider a hybrid approach to allow your email to look like a responsive email. Here, hybrid coding technique is used that help emails render just like the responsive version in the third-party apps without relying on media queries. The scratch and flip effect in emails is one of the most productive ways to keep the flame of customer relationships burning. 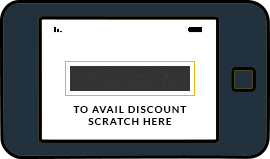 The scratch effect allows you to send out coupons, offers, and other discount codes. Your recipients can scratch the code and redeem the offer easily. If you have a new product or news to share, using the scratch effect works great. 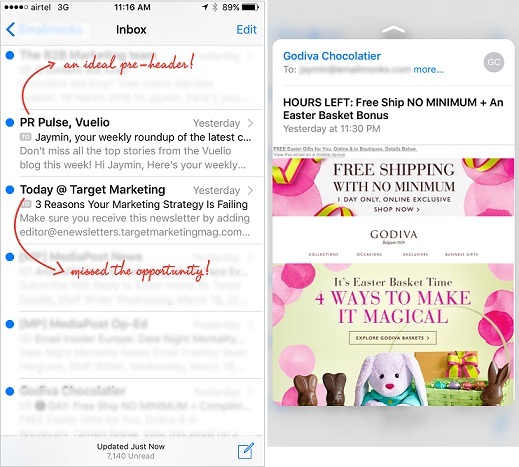 Similarly to menus or accordions in email, flip works wonders to engage more mobile users. Visual effects have a lasting impression on any promotional campaign. When it comes to email marketing, interactive graphs are an added bonus for showcasing information. 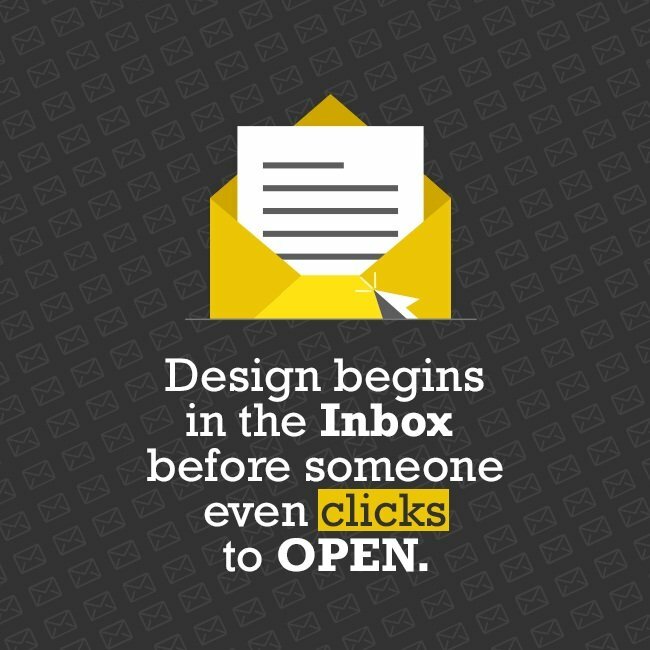 Not only do they increase your email’s visual impact, but they also help boost the credibility of your information. Rotational banners are great for emails stuffed with multiple images, CTAs, product/service specifics, other offers, and discounts. 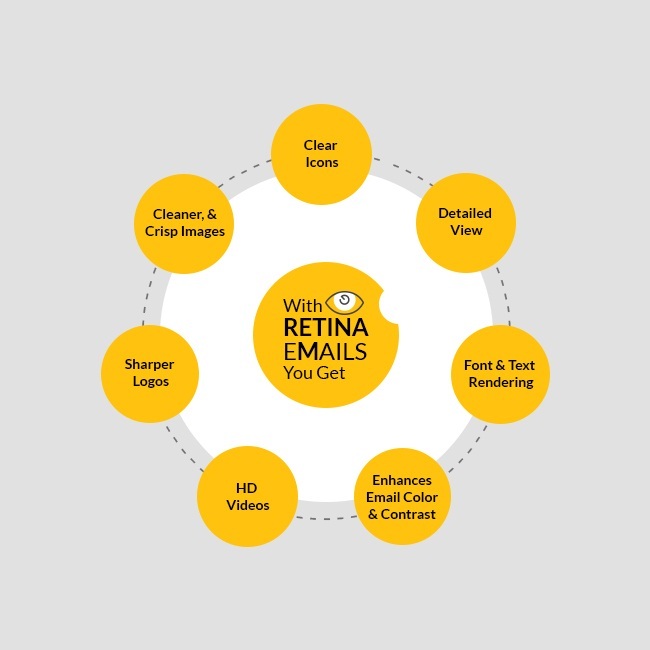 Besides being compatible with Apple Mail, Thunderbird, mobile-native email applications, rotating banners carry multiple advantages, from showcasing multiple images to driving customer interactions. Marketing Sherpa revealed that the use of GIFs in emails can help increase the conversion rate by 103 percent. GIFs in emails with enhanced email client support are now being implemented by email marketers worldwide. While some retailers are using them to display product gifts, explainer animations, and more, a few information technology companies are also using GIFs to show how interactions on their app work. GIFs are proving to be an effective tool to build user engagement, inviting an increase in click-through rate by up to 26 percent. GIFs are compatible across all platforms, except for Outlook and Lotus, which will only show the first frame. Besides being appealing, your emails should possess relevancy and uniqueness. Sliders are a revolutionary way to enhance your email campaign, allowing you to display multiple products in one go, generate curiosity, and much more. Sliders are compatible with email clients like Apple Mail and Thunderbird, while other email clients will provide a smooth and appropriate fallback for the slider. Email campaigns are all about making your emails look exclusive. It’s also important to create a sense of urgency in an email with countdowns to promote any sale or event. The countdown feature is compatible with all platforms, though Outlook and Lotus will render the images only if they are provided with proper fallback support. It’s a new era for email design best practices. Harnessing open data and analyzing industry-wide email open trends is crucial to refining the design strategy for your email marketing initiatives. If you come across email marketing data that is similar to your own audience, you can use that data to make informed design decisions. Tracking user (subscriber) behavior and understanding their engagement patterns can be integral to creating and making design adjustments engage, convert, and maximize ROI for your business. Have you got your email design plan ready for your next email marketing campaign?